9x12, xii + 289 pp. During the period 1820–30, the noted pianist, composer, and teacher Johann Nepomuk Hummel was commissioned by the English entrepreneur J. R. Schultz to make arrangements of symphonies, concertos, and twenty-four opera overtures. All are scored for an ensemble of piano, flute, violin, and cello. 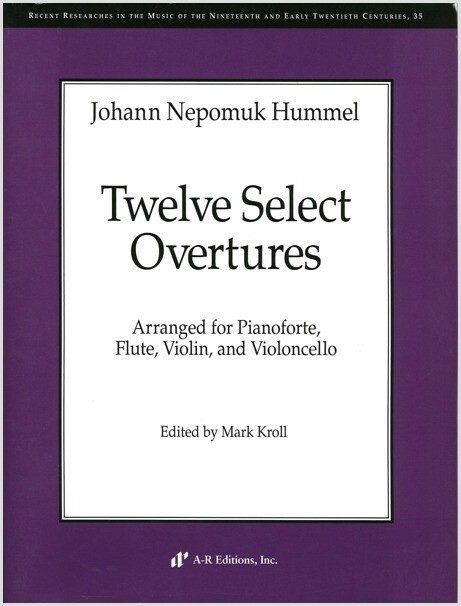 Twelve Select Overtures, the first of two sets of twelve overture arrangements, appeared in London in the early 1820s. The practice of arranging large-scale works for small ensembles was very popular during the early nineteenth century. Playing transcriptions was an ideal way to learn the newest compositions and a favorite mode of home entertainment (and, at times, of romantic courtship). The vast majority of the public experienced orchestral music through the medium of chamber music, in the privacy of their living rooms. Many composers were asked to make such arrangements, but their efforts met with limited success. Hummel, however, was ideally suited to the task. A student of Mozart and a friend and colleague of Beethoven, Weber, and others, he had also conducted many of these operas in his capacity of kapellmeister in Weimar. Hummel's arrangements of these twelve overtures are masterful examples of the genre and are also a joy to play. The set includes some of the best-known and most popular overtures by Mozart, Beethoven, Weber, and Rossini, as well as examples by composers who are less well known. They open a window on the world of early-nineteenth-century opera and also provide valuable information about the performance practices of the period. R. H. Stewart-MacDonald, Music & Letters, 89/4, Nov. 2004.